Jmy James Kidd and the Sunland Dancers "Body Bags" performance at the Marciano Art Foundation. Courtesy of Marciano Art Foundation. And when I say cool, I mean smart, challenging exhibitions with some surprises. A friend of mine urged me to see a dance performance at the Marciano that would run over the weekend for only two days. 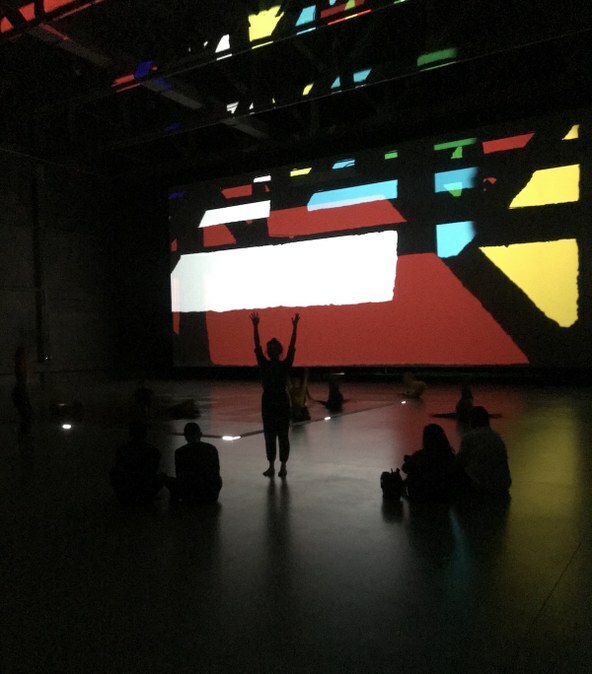 So there I was, sitting in the dark on the floor with a few dozen other people, emerged in the mysterious interaction between Jmy James Kidd and the Sunland Dancers and Olafur Eliasson’s Reality Projector light and sound installation. Installation shot, With All My Love for the Tulips, I Pray Forever, Yayoi Kusama. 2011. Marciano Art Foundation. Photo by Edward Goldman. You might think nothing could compete with that… Yes, unless you step into the visually intoxicating sculptural installation by famous Japanese artist Yayoi Kusama, with her signature polka-dots in red covering the entire room – floor, walls, and ceiling. Unbeknownst to me, this installation opened to the public just a few days earlier, and I was delighted to learn that this is the latest acquisition by the Marciano Art Foundation. So my friends, you don’t want to miss this piece by Kusama with its title, With all my love for the tulips, I pray forever. Lobby of California African American Museum, with the mural Gary Simmons: Fade to Black. Los Angeles. Photo by Edward Goldman. 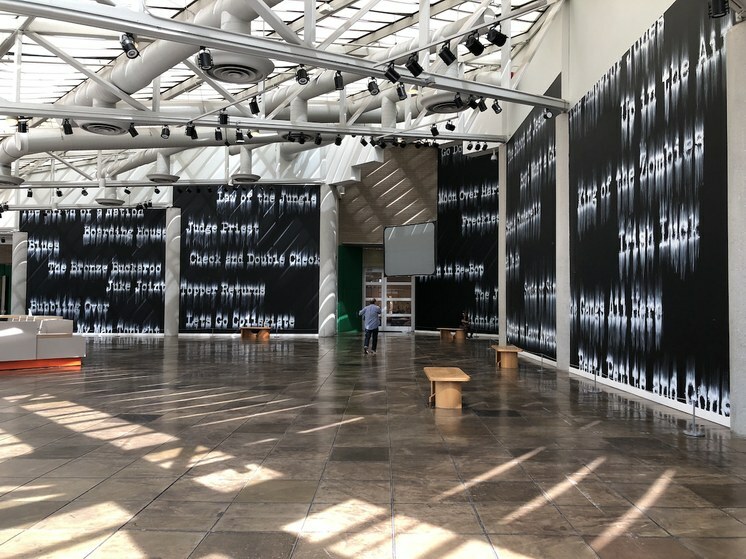 My next stop was at the California African American Museum (CAAM), with its most spectacular lobby that I was eager to see one more time before Gary Simmons’ monumental 5-panel mural in chalk, Fade to Black, was taken down. The text on the mural consists of titles of vintage silent films that feature all African-American casts. Installation shot, How Sweet the Sound: Gospel Music in Los Angeles. CAAM. Los Angeles. Photo by Edward Goldman. 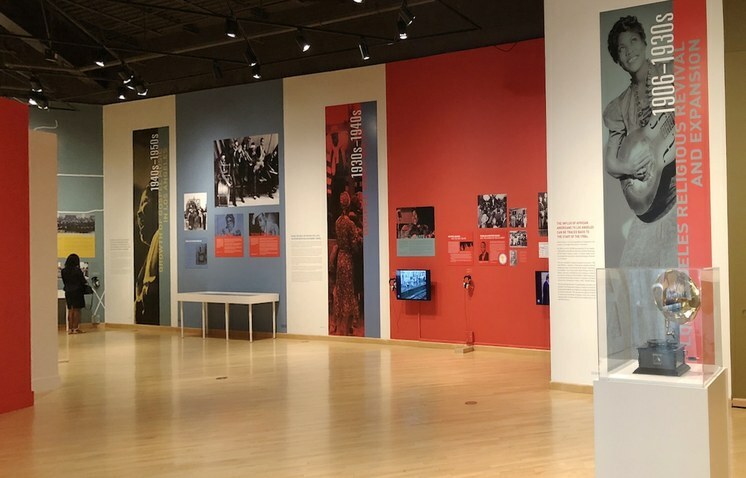 Of the three current exhibitions at CAAM, the largest and most ambitious one is titled, How Sweet the Sound, telling the story of how Los Angeles has become a hub of 20th century gospel music. This exhibition is a collaboration with the USC Gospel Music Archive, and it’s a delight for both your eyes and ears. Installation shot, Shinique Smith: Refuge. CAAM. Los Angeles. Photo by Edward Goldman. 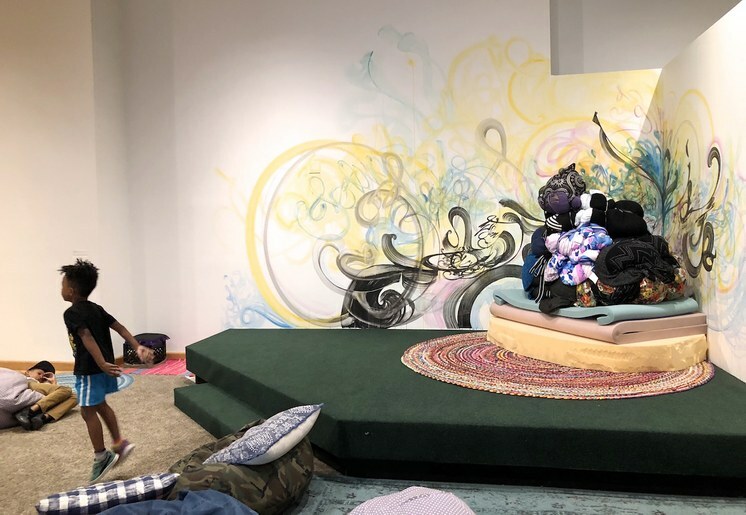 I was also eager to see Shinique Smith’s Refuge, the exhibition my colleague Hunter Drohojowska-Philp covered for Art Talk a few weeks ago. 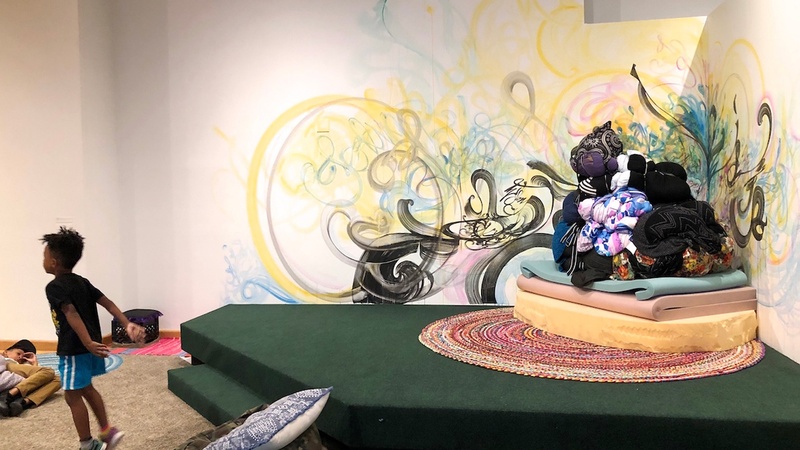 “The artist uses scraps of fabrics and cast-off clothes to make an art exhibition of poignant connections to [homeless] conditions just a few blocks away from the museum.” The exhibition, with its focus on homelessness, reminds us that the pain and drama of human life can become the source of great art. L: Detail shot, I heard you got arrested today. Mark Bradford. 2018. R: Installation shot of Bradford’s new work at The Broad. Los Angeles. Photos by Edward Goldman. Due to the hot weather, the long line that is usually in front of The Broad was mercifully short. I always like to check out the latest installations from the permanent collection there. 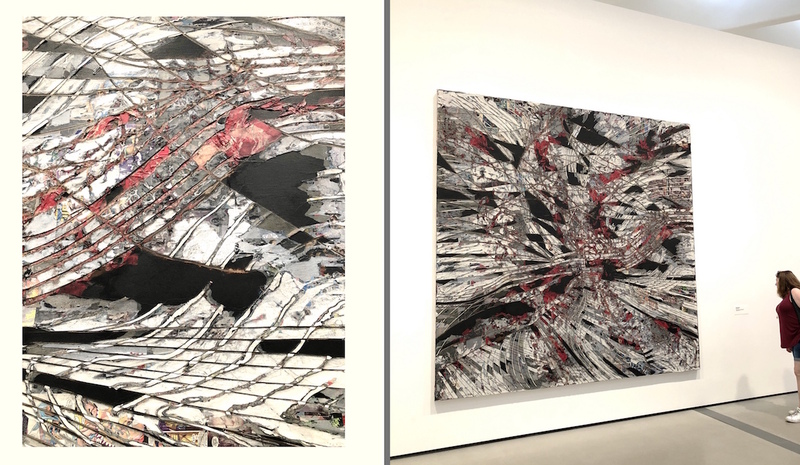 My absolute favorite was a new large-scale mixed-media collage by Mark Bradford, I heard you got arrested today (2018). From a distance, it looks like dozens of freeways merging into one apocalyptic storm. But, if you put your nose close to the surface, you realize that the artist is like an archeologist, digging into layers upon layers of material history. Installation shot of The Broad’s 2015 installation of The Visitors. Ragnar Kjartansson. 2012. Los Angeles. Photo by Edward Goldman. 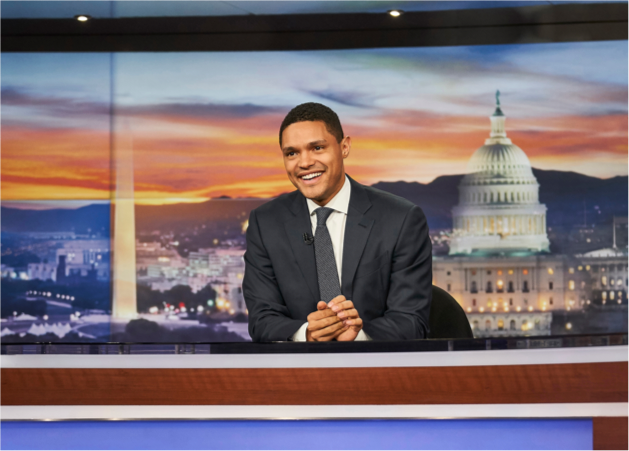 When The Broad opened three years ago, one of the most popular artworks was the 9-screen installation by Icelandic artist Ragnar Kjartansson, The Visitors. Now, it’s been re-installed, and one can spend more than an hour experiencing Ragnar and his musician friends performing simultaneously in different rooms of a large, slightly decrepit mansion. Poor me, I entered the installation only 15 minutes before the museum closed, so I was politely escorted out before I could see the installation in its entirety.